Let's celebrate the holidays and ring in the new year with fabulous prizes. 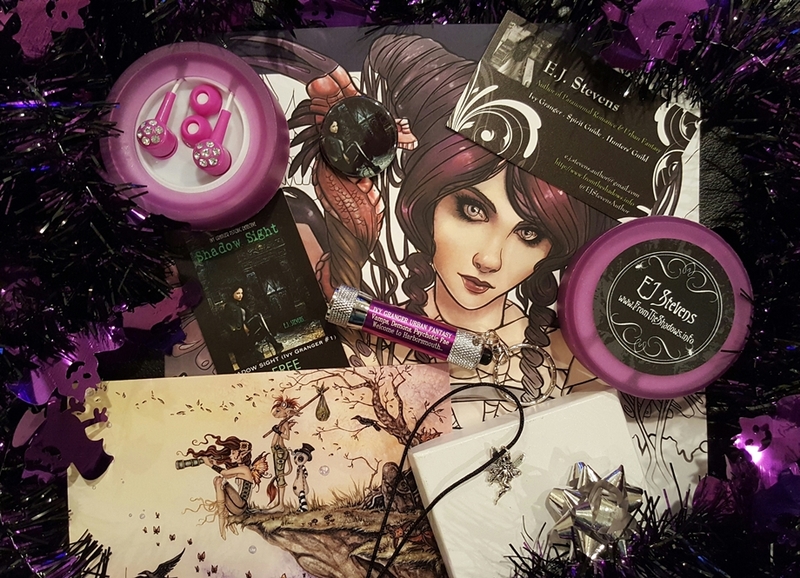 Today we are giving away a HUGE dark faerie themed prize pack. To enter, please use the Rafflecopter form below. This giveaway is open to the US, UK, and Canada. Giveaway begins December 15, 2016 and ends December 31, 2016. REMINDER: All entries will be verified. Please do not claim that you followed/subscribed/commented if you did not do so. False entries will be disqualified and we reserve the right to ban emails from future entries. Thank you. Cat Sidhe is a good one. I've always been fascinated by the kitsune, but haven't read a lot about them. Do dragons count? I love me some dragons. I'm decorating my bedroom in dragons. I also like gryphons. I've always enjoyed dragons or anything from any side of Fairie. Mermaids definitely. I love mermaids. My favorite creature is any creature that charms people then lures them to their death. It's fascinating. Kimberley Hamilton: I prefer faeries or mermaids! Thank you so much. I haven't been able to check out all my favorite blogs lately because last semester of school was brutal. I'm off for the holidays now and able to touch up on my favorite blogs :) Thank you for the giveaway! I forgot to put in my favorite. My favorite would be a fairy. I always fall for them when reading a book. Next up would be dragons. I have always loved faeries. Oh my, I have too many to list. But if I had to narrow it down, I'd go with sirens, succubi, and harpies. All 3 aren't used nearly enough in urban fantasy. I think Cerberus or harpies would be my favorite. I like gargoyles. Not many books out there on them though. I have a fancy for battle unicorns and kirin. Fairies and unicorns are definitely a fav! Selkies, elves, mermaids and dragons. I can't pick just one! I like the Faeries better. I love Faeries! Thank you! Fairies and pixies are my fav. I also love vamps and weres. I love Dragons the most. My favorite creature from folklore are banshees. Faeries are my favorite but dragons do come in as a close second. Faeries are my favorite .Awesome giveaway.Thank you! Entry form name: Laura S.
I have always been fascinated by unicorns. I love them all. Each has their own way of teaching lessons and entertaining me. However, if I had to pick a favorite, I'd probably go with leprechauns and pukas. Thanks for the chance. This is an awesome giveaway! Are shifters folklore? Lol if not it's unicorns! My favourite would have to be unicorns. I love Pixies because they are trouble makers! I really like the Kraken and the Griffin. Oh gthis is a tuff question considering I love so many LOL! Pixies, Trolls, Goblens, Dragons! Honestly I can not choose! Give me a fairy any day. Dragons are my favorite! I've always loved them! I love Faeries, although I seem to have irked my Tomte this year (sigh).